They’re a wonderful team, and this is high-impact volunteering. As a nonprofit start-up, seemingly small tools/resources really matter. A nifty poster version of the graphic will be featured at the upcoming Global Health Information Forum in Bangkok and the art will immediately have a home in our team’s presentations. More than a few times, I’ve been asked for a visual representation of FrontlineSMS:Medic‘s use cases. I can always flip through photographs and tell stories, but there is demand for a more graphic and ‘networked’ explanation. I took half an hour today to sketch out a few – many others were left out – in an experiment. I’m looking for some feedback – in your eyes (whether or not you’re familiar with FrontlineSMS:Medic), is this helpful? Pop!Tech has published the presentations from this year’s Social Innovation Fellows, and I thought I’d share the 5-minute talk on FrontlineSMS:Medic and the Hope Phones campaign. The fellowship program challenged us to rethink our presentations, impact models, financial sustainability, and media strategy — making sure we left with a ‘way forward’ and a community of support. Be sure to check out the other fellows’ amazing work here. I’m behind on blogging, so this is an attempt to catch up by combination. Maybe the alliteration in the title makes up for the randomness of this post… maybe not! Last week I found out who will be joining me in Camden for the PopTech Social Innovation Fellows Program, and they’re an inspiring bunch. I’m ready for light-bulb moments, humbling conversations, and challenges posited by the faculty. Finally, I’m looking forward to exploring a new town. I found an apartment and office space in Washington, D.C. and will be here for a year, maybe longer. Feel free to email me at josh.nesbit@jopsa.org, reach out on Twitter (@joshnesbit), or leave a comment here if you’d like to grab coffee. My office is at 910 17th NW between I and K.
Wishing everyone a happy Sunday. The Medic Mobile software development team, led by Dieterich Lawson, just posted videos of a new software plugin, PatientView. The PatientView plugin creates a new user interface within FrontlineSMS – one screen where staff at a central computer can view all data relevant to an individual patient. Users will also be able to sort through, update, and add new records from the central computer. This plugin is designed to manage patient information at small health centers, some of which will move on to a robust medical records system in the future, others of which will prefer to use FrontlineSMS to send data to a medical records system at the nearest large hospital. We’re very excited about the plugin, which has been shaped by feedback from numerous clinical partners and healthcare workers in the field. From the start of our projects to the finish, it’s people who determine what FrontlineSMS:Medic does, when we do it, and why. The tech tools we use exist to serve patients, community health workers, and healthcare professionals – not the other way around. This mindset is critical for a number of reasons. I’ll explain. We strongly believe that projects should start when clinics ‘pull’ them to a site, as opposed to having projects ‘pushed’ onto healthcare providers. Ken Banks included the (very important) push/pull differentiation in his “Development best practices for beginners” series. Clinics are not just convenient places to pilot technology innovations. Healthcare providers should demand programs they need, and we should be ready to respond. Local staff should determine how the tech will be used, and we should be flexible and helpful in working through use cases and functionality. You’ll notice that I’m not in any of the shots. It wasn’t my place to train the community health workers – (1) I don’t lead their other training sessions, and (2) I don’t speak Chichewa well. I’ll work one-on-one with those who need individual attention – although, the CHWs do self-organize into pairs, and those who need help will find it from others. We made it clear that local staff were running the show. So, we created handouts of blown-up number pads, which everyone ended up using. Our work involves technology, but the focus is on the people. A bag full of cell phones without community health workers using them to serve patients is… just… heavy. With this post, I’m hoping to dispel some mHealth myths and start to dissolve the perception of mHealth programs as unattainable for small and large clinics (with or without technical know-how). Below, you’ll find pictures and prices for all the technology we’re using for the Partners in Health project in Malawi. Here’s the key: except for FrontlineSMS, all of the following tools were already being used locally. FrontlineSMS is free software, and incredibly easy to use. The Acer netbook cost $200, and the modem was $150. You can get the phone and data cable for $20 or less. We needed mobile phones. This is how Hope Phones and the generosity of phone donors helped out, in a big way. We got these RAZRs for $15 each, and we’ve used models that cost as little as $6.50, which work just fine. Solar panels are useful if electricity’s scarce, and we almost always implement sharing systems. We’ve found that 3-4 community health workers can share a panel, given efficient charging rates. The product pictured cost $20, and we’re testing $7 panels right now. Of course, we’re buying local SIM cards (cost less than $2 each). The last piece of the puzzle is cell network coverage. Luckily, we’re not building any towers; coverage is good and always improving. Of course, people make this work and give the tools value. My next post (part 2 of 2) will focus on implementation and training (both FrontlineSMS training and SMS workshops with the community health workers) and I’ll include videos. I’m happy to answer any questions – just leave a comment. Hello from Neno! Here, I’ve drawn out the use case we’ll be focusing on for the Partners in Health pilot at Neno District Hospital. There is a lot of potential for the FrontlineSMS:Medic system to be used to track patients in a number of programs: e.g. ART, pre-ART (HIV-positive patients not yet on antiretroviral therapy), TB, PMTCT, Kaposi’s sarcoma, chronic care. So, we have: touchscreens in the hospital for patient registration and clinical data entry, electronic medical records following patients and creating alerts, and cellphone-wielding village health workers tracking remote patients. I think it’s exciting, and we’ll be structuring the outcomes assessment this week. We’re training 130-150 village health workers next week. In the picture above, the VHWs had gathered for a training session on multi-drug-resistant TB. You can see me in the back, watching intently. Next week, I leave for Neno, Malawi where, thanks to the Haas Center for Public Service and Hope Phones donors, I’ll be working with Partners in Health and their partner organization Abwenzi Pa Za Umoyo (APZU) to set up a FrontlineSMS:Medic program. I’m excited about this pilot for a number of reasons. First, PIH is well known for stellar communty-based care including their village health worker (VHW) training and support. We’ll pilot the system with 150 VHWs. Second, we’ll be running FrontlineForms, which will allow for structured data collection. Finally, Baobab Health Partnership implemented their revolutionary eVCT touchscreens for clinician-patient interactions within the clinic. With the upcoming FrontlineSMS-OpenMRS integration, it will be feasible to create a continuum of data from these touchscreens to cellphone-wielding VHWs in remote villages. I’ll be blogging here as the project unfolds. I won’t be alone in Malawi – FrontlineSMS:Medic’s Medical Director, Lucky Gunasekara, will be setting up projects with VillageReach and the Clinton HIV/AIDS Initiative a bus-ride away. Keep tabs on @bikobiko and www.bikobiko.com for updates from Lucky. 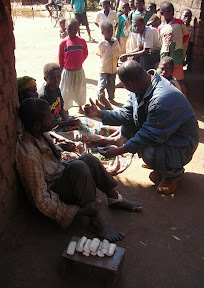 Isaac Holeman (our Clinical Programs Director, @isaacholeman, www.isaacholeman.org) is headed to St. Gabriel’s Hospital in Namitete this August – home of the Mobiles in Malawi pilot. After working with PIH, I’m joining Lucky in Cameroon to pilot new applications for FrontlineSMS:Medic with the Global Viral Forecasting Initiative. Needless to say, we’re excited about the summer.